I’ve been away all day and almost missed a big milestone. Today is the anniversary date of my first blog post! 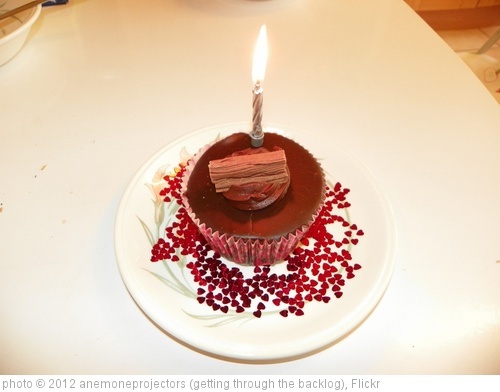 Happy birthday to the blog! What a year it has been. I’ve been so busy with the Media Blitz, etc, I forgot this occasion. Well, Cheers! 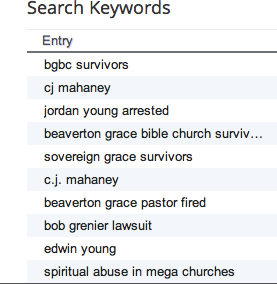 I find it interesting that in my very first post, I mention that I’m aware that others outside of BGBC may “venture upon the site,” because now the blog is primarily just that – – – discussing spiritual abuse in other churches and in a broader sense. That most definitely has happened! That first post mentions that I couldn’t see IP addresses from commenters. That was true on Blogger, but on WordPress, I can see IP addresses. Don’t worry! Identities are kept strictly confidential. Obviously I updated the little summary below, but notice the amount of hits. The old blog continues to get hundreds of hits a day. Now maybe some of you haven’t changed your bookmarks, but I can tell by the searches that a lot of people are still searching and landing there. Next postSingles in the Church: Treated with Respect and Dignity? How exciting, Julie Anne, your one year Blogiversary!! Celebrating with you! And being almost too busy to remember, how neat is that?! It has been an amazing year. And now so many new friends and a community of love and care and share! Now that’s a wonderful milestone to celebrate! Hooray!!! Barb – and it’s almost been a year since I connected with you. I think I can find the exact date. You posted on my blog and that is how I had your contact info. You were so helpful to me and put me in contact with great support people. Thank you! Happy anniversary Julie Anne. Your work is very important and you have helped so many. Thank you for standing up against abuse. Thanks you for being a friend. Julie Anne: Thank you so much for your clarion voice for the victims of spiritual, physical and sexual abuse in the Church. Thank you for your support and care for all of us. You have a beautiful, magnanimous heart for all survivors of abuse. Bless you!! Happy one year of a huge milestone Blogiversary Julie Anne! 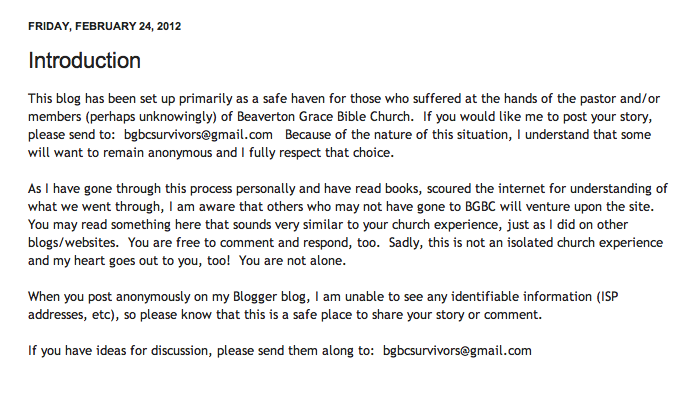 Your blog has been one of so much compassion and love for so many people who are hurting spiritually. You bring to the forefront a wide variety of topics that need to be covered, so that people don’t feel alone in their hurt, and pain. This is truly a support network, and a very successful one at that. When you call the abusers out, they fear you now. It’s been a real eye opener, and a learning experience for me. May God continue to be with you as you continue in your healing, and with others on the blogasphere. You have done a lot of good, Julie. Thanks for standing up for what is right, even when other people say you’re wrong. May I say that I’m looking forward to the day when blogs like ours are irrelevant (! )–yet I wish you continued blessing for as long as your blog is needed. ja, you have modeled for us how to do it, how to fight with proper righteous fire! your ministry as advocate and voice for victims of abuse has just begun. you have truly been an inspiration to us all. happy day, Julie Anne Smith! Congratulations! Good for you, and keep it going…you are doing awesome! Happy Blog Birthday! You have such an effective ministry. Keep up the good work. 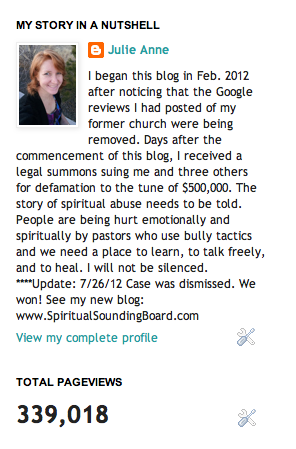 Julie Anne, thank you for your blog and your fight against spiritual abuse. Keep more coming- the Lord is good and gracious! Thanks, everyone! I appreciate the support – more importantly, I appreciate the exposure that is going on when you start talking and ranting and tweeting and spreading links along with me. It all helps so much! Hey, are there any Mac geniuses around here? I’m trying to figure out a way to compile a list of Twitter account names on my dashboard or toolbar so that I can quickly go down the list, quickly copy the relevant @TwitterName to post in a Tweet, alleviating the time spent searching for names. Any ideas? Must be efficient with my time! Happy Birthday to your blog!! You’ve covered a lot of ground in just one year! It’s scary to think that spiritual abuse even needs to be a hot topic, but thank God that someone is giving a voice to it. May your blog enable all of us to push back. Hooray for your 1 year anniversary!! You and your blog have already touched so many lives in such a short time. And it is only the beginning, I think! Thank you for all you do, my favorite Jezzie! Julie Anne, there is a program called Stickes on a Mac. (If it doesn’t show up in your icons at the bottom of the screen, look for it in Applications.) You can create as many sticky notes as you need, and you can have those sticky notes remain on your desktop if you wish where you can copy and paste to and from them. If you want the clutter of the notes to go away, just quit the Stickies application. The next time you open Stickies, your notes will still be there. I like them because my note can be as big or small as I need. I often paste things here that I’ve read, want to remember, or things I need to do. Year Two: Rock the World! Happy Blog-a-versary, Julie Anne! Thank you for giving a voice to so many, and for singing a song of freedom to many whom I suspect might not live in the sunlight yet! Thanks, Ken – that last phrase – – – “and for singing a song of freedom to many whom I suspect might not live in the sunlight yet!” That gets to me – – – it compels me. Year Two: revolutionary Christian Spring! Happy “Blog-a-birthday” to one of the best Jezebloggers around! Happy Blog Birthday! Thank you for all you do! So grateful for this blog and so thankful for your voice in fighting spiritual abuse ~ prayers and cyber hugs to you! Happy blogday Julie Anne and blog on! You are amazing! Happy blog birthday. Praying for you. Julie Anne, Thanks for all you have done and are doing. You have been instrumental in helping me find my voice. And together, we move forward. Hey, there would be no blog without participants. Well, I guess there could be, but it would be pretty boring. You motivate me, so thank YOU! Congratulations, Julie Anne! I am thankful that Barb told me about your blog. I am thankful for both you and Barb as well as Kathryn for your patience, understanding and prayers. Congratulations Julie Anne, it’s been an eventful year, so eventful that it seems more like two years. No kidding, Craig! But it has flown by. I still haven’t gotten my normal sleep pattern back, but maybe it’s just my age – OY! Meaghan, thank you dear friend. Love you, WMD!